The Post-Crescent has a look at attempts to pass financial literacy legislation in Wisconsin over the last few years. The article is most interesting for listing the reasons legislation like this fails and for providing financial literacy champions a roadmap to follow. Lawmakers in Wisconsin made a run at adding Wisconsin to the list last year. Rep. Scott Krug, R-Nekoosa, and Sen. Howard Marklein, R-Spring Green, proposed requiring public schools to include financial literacy in curriculums. Their bills also would have required statewide testing on the subject and financial literacy information to be provided during college orientations. The Raleigh News & Observer has a great article this week about teaching teachers financial literacy. The piece touches on the difficultly of squeezing personal finance into other curriculum and the need for dedicated training. That lack of preparedness is a real concern because, in North Carolina, personal finance is required to be taught to students from kindergarten through eighth grade as part of their social studies courses. In addition, Wheat said, about 40 percent of a civics and economics course that high school students must pass before they graduate – American History: The Founding Principles, Civics and Economics – is devoted to personal finance and economics. This blog recently noted a report in Texas showing disparities in who gets efficiently licensed to sell life insurance in the state. In addition to the race/ethnicity disparity already covered in a previous post, the report also showed a gender disparity - with men passing the licensing exam at a rate of 57% compared to 51% for women (page 66). Just 56% of American women have life insurance coverage, compared with 62% of men, according to LIMRA’s Life Insurance Ownership in Focus, U.S. Person-Level Trends: 2016. While the amount of coverage women purchased spiked nearly 21% since 2010, researchers say it’s still inadequate relative to men at $160,782 vs. $206,357. The article cites a few reasons why men take advantage of life insurance more than women, but could another be data like we see in Texas? More men are licensed as agents, and women seem to encounter barriers to entry that men do not. Does this contribute to the usage disparity? It is question worth considering. This blog has spent years looking at reports published by the Texas Department of Insurance that show pass rates on licensing exams by demographic. The 2016 report is out, and sadly, it continues to show distressing data. Here is a look at pass rates on the Life agent exam last year by race/ethnicity when controlling for education (page 86). 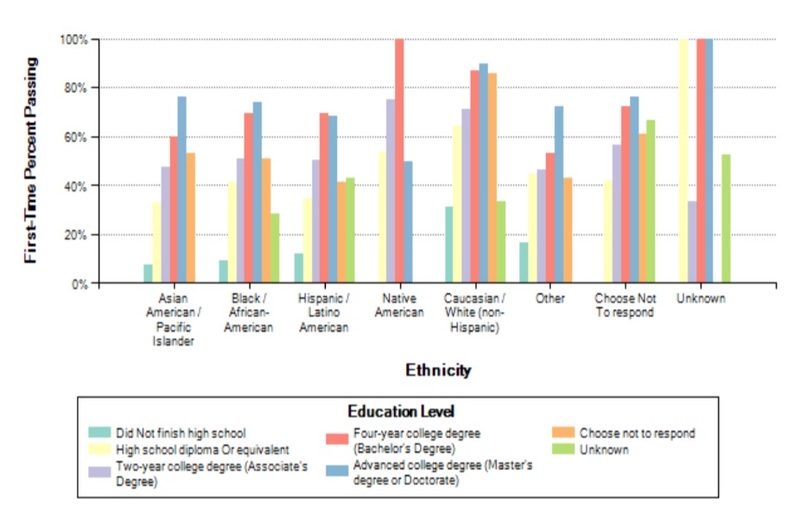 As in past years, Caucasian/White applicants continue to enter the insurance profession in Texas in a more efficient manner than other testers, even when controlling for education. This blog will dive deeper into the report in 2017. The data seem to suggest the presence of barriers to entry for some testers. With national studies like LIMRA's Facts About Life 2016 continuing to report that certain segments of the country are under-insured and under-served, it is critical that all stakeholders, including regulators, do their part to make sure all communities have access to important financial protections.